Inspired by the infectious afro-beat music of Nigeria and its neighbours, The POAO delivers contemporary African funk to Australian dancefloors. This mammoth ensemble comprises musicians hand-picked from Melbourne’s music scene. The experience and creativity of these established musicians energise the group’s original compositions and the sound of the entire band is a force to be reckoned with. The POAO’s powerful MCs and tribal rhythms are the modern-day “musical weapon” that Fela Kuti conceived of. Their conscious lyrics and West African grooves are relevant today while remaining faithful to the message of afro-beat. The group is the brainchild of Zvi Belling, Ethan Hill (DJ Manchild) and Tristan Ludowyk who are long- time friends and musical collaborators, each with vast and diverse musical backgrounds to draw upon. The band’s directors recently travelled to Africa to promote the new single and recorded with African hip hop stars Tumi (South Africa) and Modenine (Nigeria). These artists feature on the band’s ARIA-nominated album “Do Anything Go Anywhere”, which was accompanied by a sold-out 12” vinyl release. 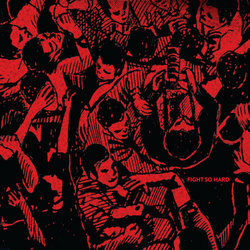 The POAO release ‘Fight So Hard’, the first single from their long-awaited second album ‘Naming & Blaming’. Fight So Hard is a simmering slow-burn with MC One Sixth trading rap verses with singers Kuukua and Lydia Acquah, Fem Belling and Lamine Sonko. Vocals are broken-up with heavy brass sections and extended instrumental improvisations while the understated rhythm section bubbles away.